The alarm went off at 6 am, but I really didn’t need it as I’d hardly slept a wink. I was too excited and my body clock went off at 5 am, though I managed to coax myself into a few more minutes of sleep. Breakfast was just a glass of milk, not enough to fill me up but just enough to stave off the hunger pangs and last minute dashes to the ladies room. My new dress shoes felt comfortable enough until I started briskly walking the streets of New York City, then I began to wish I had worn my nice fuzzy LL Bean Comfort Mocs instead. They aren’t nearly as cute but so much more comfortable and warm. 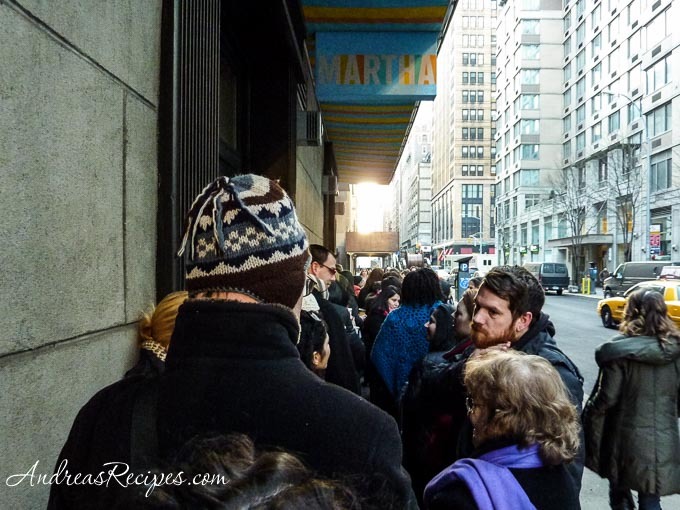 My toes were freezing as I stood in line outside the studio building and grew numb as the wait stretched on. 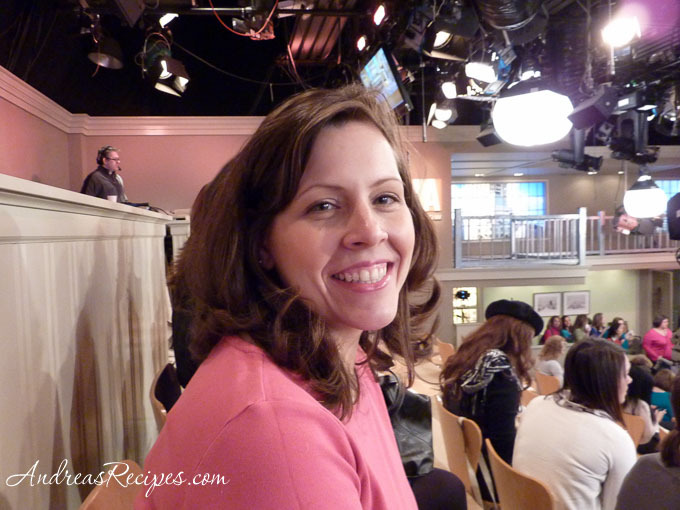 The whole process of getting into the building and going in and out of the studio was very precise and organized, not that I would expect anything less from The Martha Stewart Show. Organizers allowed a few people at a time into the building and through check-in and security, then as we passed into the waiting room, more people came in. 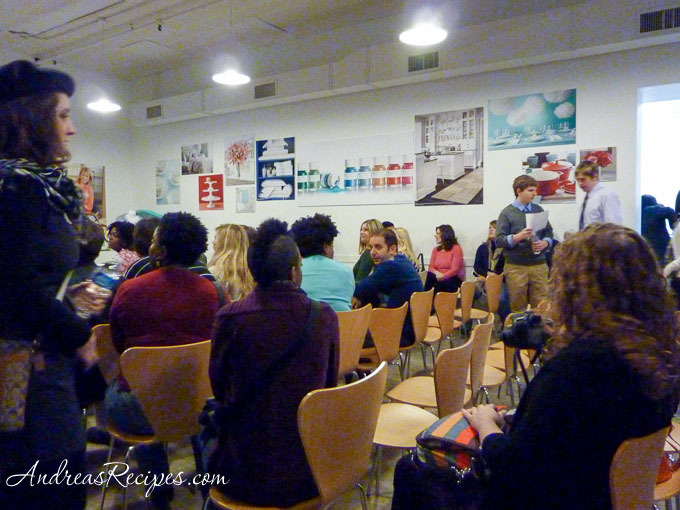 The waiting area filled slowly with audience members, and as I took my camera out to snap some photos, I realized my battery was almost dead. I’d obsessed over the rest of the details of the trip but forgot to charge the camera battery, so I quickly found an outlet in the room and plugged in, hoping to get enough juice to last through the morning. While waiting for the call to go into the studio, I had time to chat with Tami (Running with Tweezers), her friend Shameeka (The Broke Socialite) and Jennifer (In Jennie’s Kitchen). I love these gals, they are so nice and down to earth. When it was time to start moving into the studio, we were called in groups based on a symbol on our ticket, and Jennifer and I had both had the same symbol so we went in together. The process was very orderly, and as we walked into the studio various people wearing headsets asked how many were in our group then directed us to seats in the audience. The audience organizers placed us in the back row, just in front of the sound and light booths. I guess they thought Jennifer and I would be trouble makers. 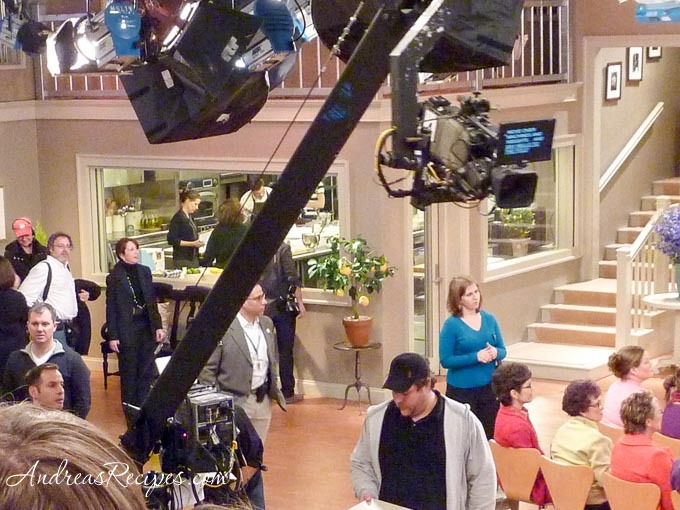 I spent a number of years performing in and working on community theatre productions, so I was as geeked about the set, lights, and cameras as I was about seeing the show and Martha herself. 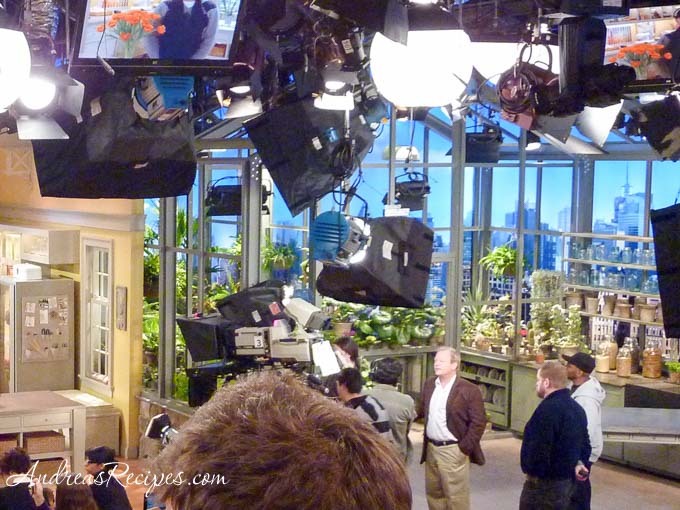 The set is laid out with a prep kitchen on stage right, then the show kitchen, a craft area, and finally a room filled with beautiful plants on stage left. The ceiling is covered with all kinds of lights, including many soft boxes, and as I studied the camera layouts I started wondering about getting a couple soft boxes to help with lighting in our dark kitchen. 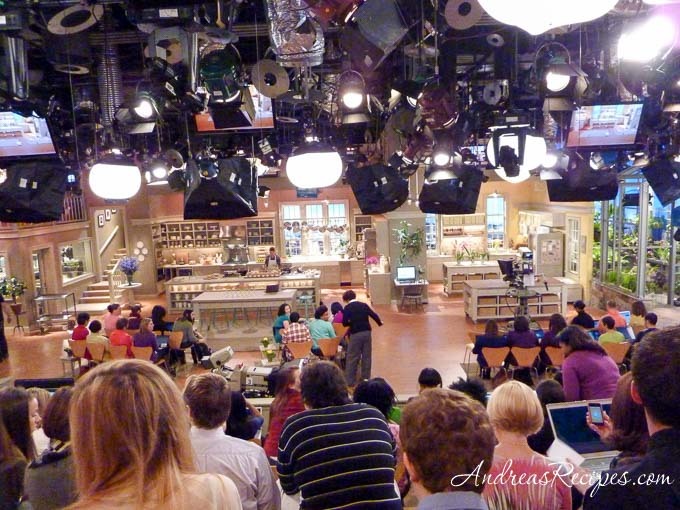 The kitchen had some gorgeous appliances and I really wanted to sneak in there and fix lunch after the show. Do you think they would have let me? Um, probably not, but a girl can always hope. 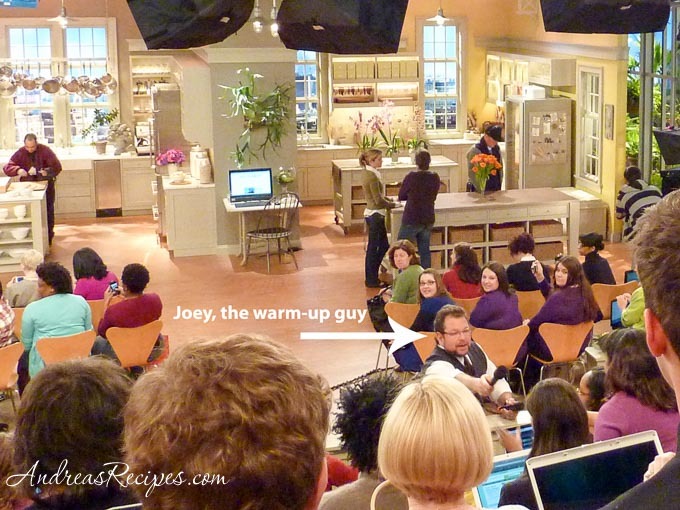 Once the audience was seated, Joey Kola, the warm-up guy started working the audience. He’s quite a hoot and it was a lot of fun to watch him. I enjoyed watching the bloggers do their thing: Pim (Chez Pim) made pad Thai, Jeff (Jeff and Martha) learned how to frost a cake, and Andrew (Martha Moments) made yarn cards. The audience hoped for some samples of the pad Thai and orange cake, but alas we were denied. One lucky blogger, Brianna Campbell (Hire Me Martha), had the opportunity to spend a day working with the Art Department. 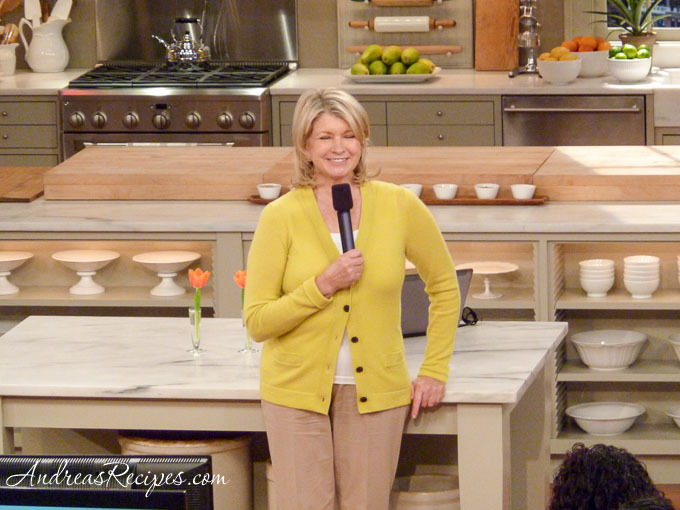 After the show, Martha came forward and took some questions from the audience. After the show was over, Jennifer and I had lunch at a noodle shop on 30th Street (the name escapes me, but the food was pretty good), then we parted and I got ready to return to DC. The bus ride was quiet and relaxing, a good time to transition from my little vacation to the bustle of family life. Can you tell I had fun? I had a fantastic time and would do this again in a minute. That is awesome! You must have had a great time there! Congratulations Andrea! That was such a good thing that happened to you, and thanks for showing us all the details. Great pictures! Thanks for sharing the behind-the-scenes scope with us. Congrats on your amazing day! So Cool. I think I saw you at the top! What a fun trip! I watched the show and was looking for you in the audience – but they scanned the cameras by so quickly that it was tough to identify anyone. Pim’s Pad Thai looked delicious! I had a great time chatting Andrea, and so glad we got to sit together. By the way, that noodle place was called Mooncake. Look forward to seeing you again soon!